The Animal Production and Health Division of FAO has established a number of expert panels to give it advice and guidance. 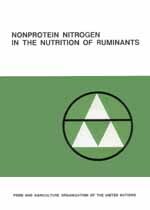 The members of these panels are appointed for their individual ability and not on a country basis, and this book, Nonprotein nitrogen in the nutrition of ruminants, is an illustration of the manner in which panel members may assist the Organization. The authors and contributors are all well-known scientists and are members of the Animal Nutrition Panel. They have given of the limited time they could spare from the execution of their normal duties to compile this book, and I wish to thank them most sincerely for their activities. It is hoped that this book will be the forerunner of a series compiled and published in this way. In addition to the two co-authors, assistance was given by and is gratefully acknowledged to K. Breirem and T. Homb of Norway, J. Kielanowski and M. Chomyszyn of Poland, and F. Whiting of Canada. This report on the use of urea and other nonprotein nitrogen (NPN) containing compounds in feeding ruminants is presented with the hope that it will serve as a useful summary of research findings and as a guide for feeding cattle, sheep and other ruminants, particularly in countries where little or no research has yet been done. Protein is often the major limiting nutrient for ruminants. Protein-rich leguminous forages are not widely grown in many areas grazed by ruminants, and vegetable protein supplements are usually expensive or not available. The manufacture of urea and ammonia for use as fertilizer has been greatly expanded in many countries, but these compounds could be used more widely in feeds for ruminants. The ability of the micro-organisms in the rumen of cattle and sheep to utilize these NPN sources to form true protein, that can be converted to meat and milk by the animals, represents an important contribution to man's food supply. The purpose of this review is to bring together selected examples of research in which urea has been used successfully to replace the short supplies of vegetable protein feeds as well as to direct attention to limitations in the use of urea and other NPN sources. No attempt has been made to compile a complete list of all published evidence, but rather to illustrate the varied types of comparisons which have been made and to offer suggestions regarding the practical usage of urea in livestock feeding practices. Earlier reviews have been made by Krebs (1937), Reid (1953), Goss (1942–43), Annison and Lewis (1959), Barnett and Reid (1961), and Blackburn (1965), while Stangel, Johnson and Spellman (1963) have presented an extensive compilation of abstracts and titles of research papers dealing with the use of urea and other NPN compounds in ruminant rations. The reader is referred to these sources for additional information.